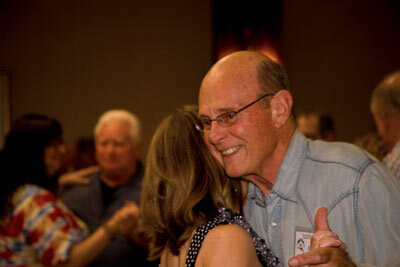 Western Film Festival Photos--Memphis 2012, page 2 (gallery 16). 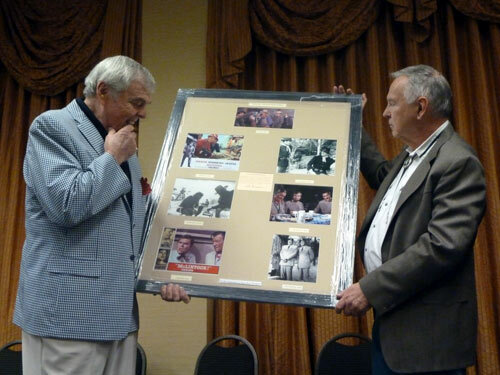 More photos from “A Gathering of Guns 4—A TV Western Reunion” at the Memphis Film Festival, co-sponsored by WESTERN CLIPPINGS, May 31-June 2, 2012, at Whispering Woods Hotel and Conference Center in Olive Branch, Mississippi. 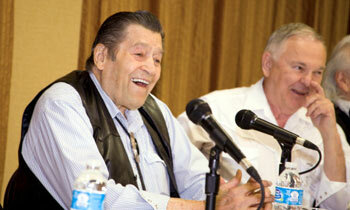 Clint Walker and festival co-sponsor and panel moderator Boyd Magers of WESTERN CLIPPINGS share a laugh during a panel discussion. 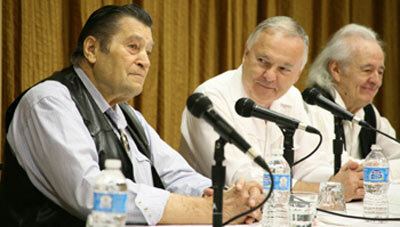 Clint Walker, moderator Boyd Magers and Henry Darrow at Friday morning’s panel discussion. 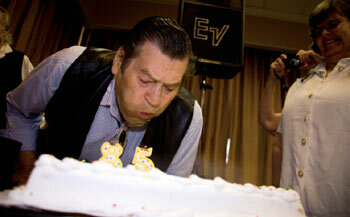 Following a panel discussion, Clint Walker’s fan club presented him a cake celebrating his 85th birthday. 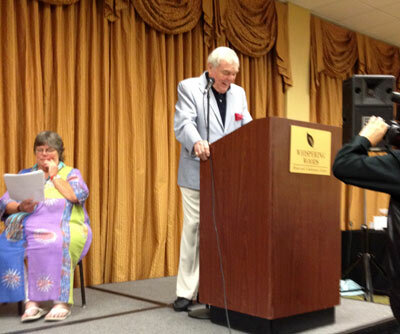 Clint Walker blows out the candles on his 85th birthday cake presented following a panel discussion by Clint’s fan club members. 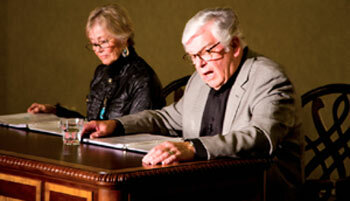 Loquacious L. Q. Jones held court all over Whispering Woods and on panel discussions. 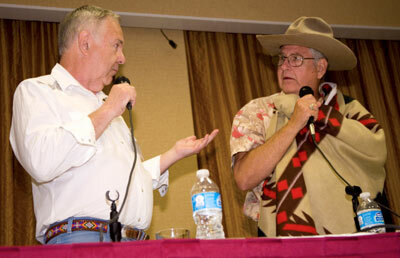 Packy Smith (right), originator of the Memphis Film Festival in 1972, moderated a panel dedicated to Gene Autry and the Singing Cowboys. 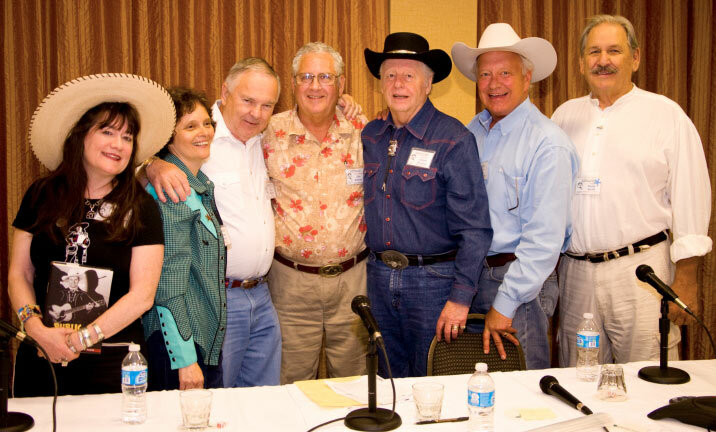 (L-R) author Holly George-Warren, Maxine Hansen of Autry Entertainment, festival co-sponsor and author of GENE AUTRY WESTERNS Boyd Magers, John Buttram, Pat Buttram’s nephew and banquet emcee, Johnny Western and Rex Allen Jr.
Boyd Magers and John Buttram clown around during the above panel discussion. 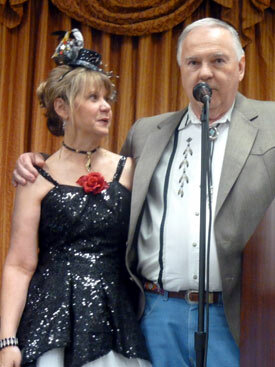 Roberta Shore and her husband Ron Frederickson (filling in for an ailing Will Hutchins) performed A R. Gurney’s “Love Letters” play Friday night in the amphitheatre before a crowd of over 320 teary-eyed people. Thursday afternoon panel discussion with Johnny Crawford, Bobby Clark, moderator Ray Nielsen, Jeff Connors and Bobby Crawford. 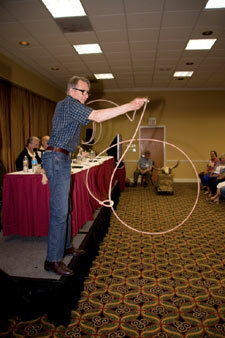 Johnny Crawford was enticed to show his roping abilities during the panel discussion. 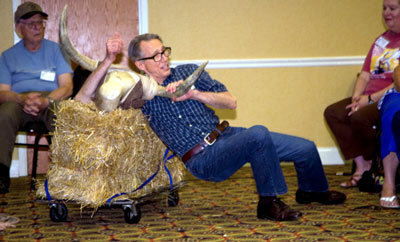 ...and he even showed the crowd how to bulldog a steer. 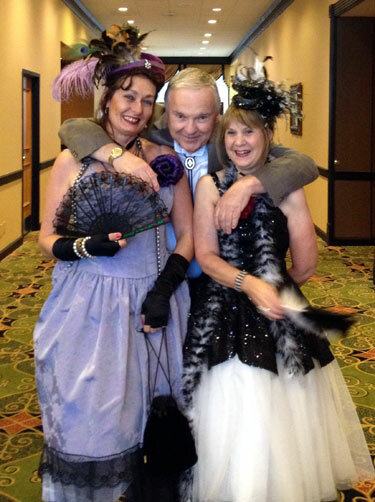 Even though James Stacy (“Lancer”) was unable to attend, his devout Lancer Ladies gathered nightly near the hotel restaurant to honor “Johnny”. 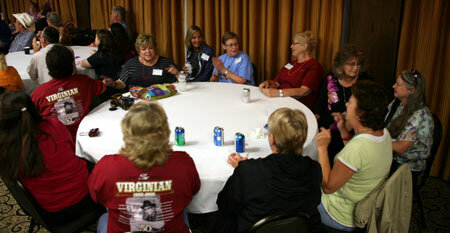 (Standing l-r): Cheryl Nelson, Tammy Wilson, Lisa Pardee. (Kneeling/Sitting l-r): Sherrill Martin, Donna Brisbin, Mary Olson, Heather Mallard, Debbie Miller, Theresa Wright, Nancy Bayne, Julie Henshaw, (standing behind Julie) Lori Tsukji, Bea Quindlen and unknown. (Kneeling in front:) Felicity Bonello. 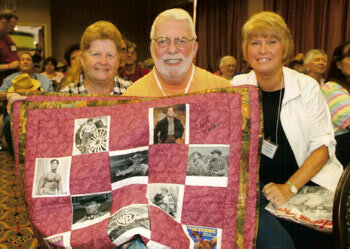 Tony Joynt (center) and his fiancee Yoland Mullenix (right) purchased the “Cheyenne” quilt made by Donna Wilmeth (left) at auction just prior to the Clint Walker panel discussion. 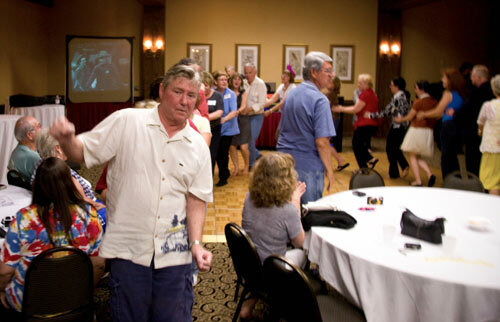 Bobby Crawford dances at the indoor “rained-out” pool party to oldies supplied by discjocky Alex Ward. 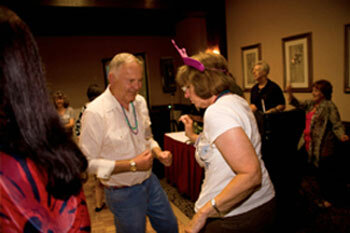 Lotsa fun was had at the Friday night party as everyone danced to DJ Alex Ward's oldies. 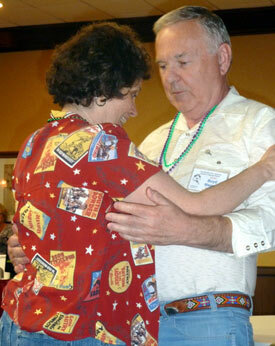 Don Quine shares a dance with Bonnie Boyd. Twistin’ the night away...Boyd and Donna Magers. Discjocky Alex Ward in the background. 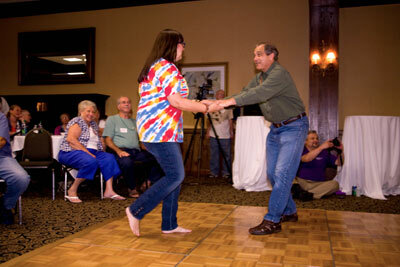 Tenderly recovering from an auto accident broken leg, Maxine Hansen of Autry Entertainment still managed one turn around the dance floor with Boyd Magers. 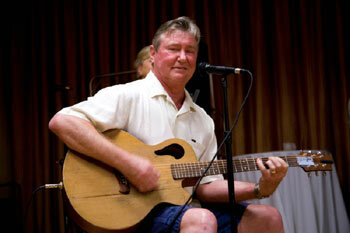 Randy Boone (“The Virginian”) sang several songs at the “pool party”. 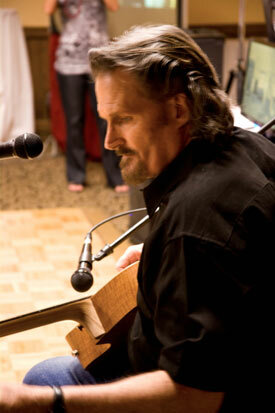 Randy Boone leads the “train” doing “The Locomotion”. 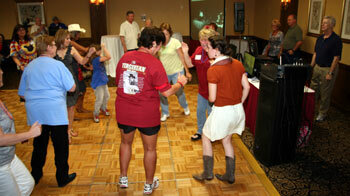 The “Virginian” Posse joined in the fun at the party. 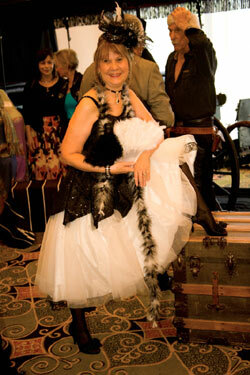 Bonnie Boyd vamped it up for the banquet as a saloon girl. L.Q. Jones, Roberta Shore and Diane Roter in the background. 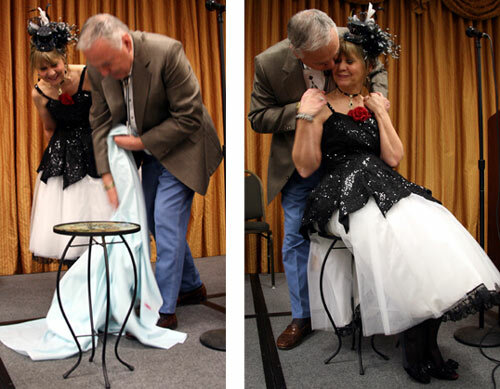 For all her untiring work in pre-festival organization, Boyd Magers believes Bonnie Boyd and her tireless efforts belong on a pedestal, so at the banquet this year Boyd presented Bonnie with her own personal “pedestal”. Boyd Magers unveils Bonnie Boyd’s pedestal and rewards her untiring efforts with a kiss. 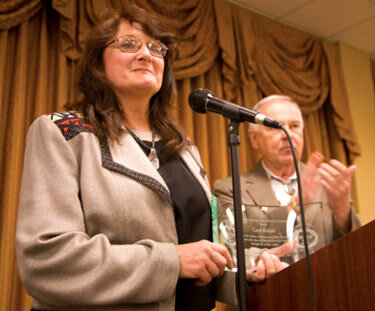 A special award was given at the banquet by Ray Nielsen and Boyd Magers to a selfless Carol Ann Kellum who creatively decorated Whispering Woods with all sorts of western memorabilia to accent the weekend. 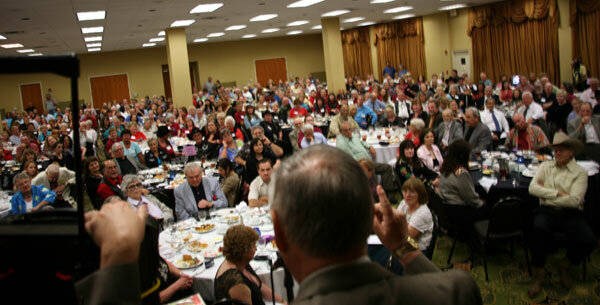 At the banquet Randy Boone sings a song about a grizzly bear especially requested by James Drury. Festival co-sponsor Ray Nielsen watches from the side. Ed Falukner graciously donated several great photos of he and Duke which Ray Nielsen framed. 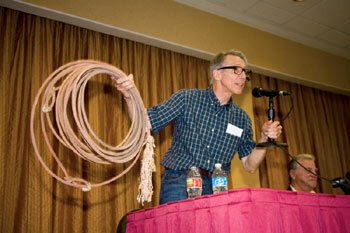 It was then auctioned off at the banquet. 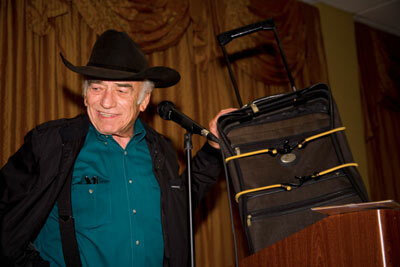 James Drury helped auction off his old tote bag at the banquet. Over $1,000 was raised to benefit the Abbey of Regina Laudis in Bethlehem, CT, where former actress Mother Dolores Hart is now a Benedictine Nun. She is raising money to refurbish the Nunnery. 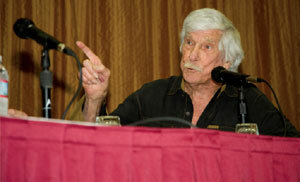 Hart co-starred in one of Drury’s favorite “Virginian” epsidoes “Mountain of the Sun”. There was spirited bidding for Jim’s ex-bag at the banquet. 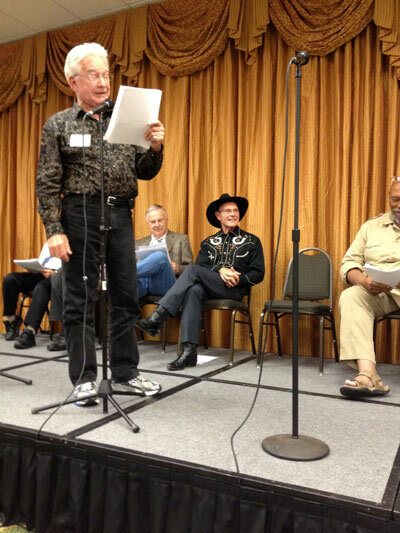 Ed Faulkner played Paladin in a fun-filled radio show recreation of “Have Gun Will Travel” at the banquet. Sara Lane awaits her opportunity to read a commercial. For the “Have Gun Will Travel” radio recreation, Boyd Magers played the part of Hey Boy's Chinese uncle. Bobby Crawford (seated left) was the sheriff, Jim Kocher was a germ in a commercial and Don Quine was the heavy. 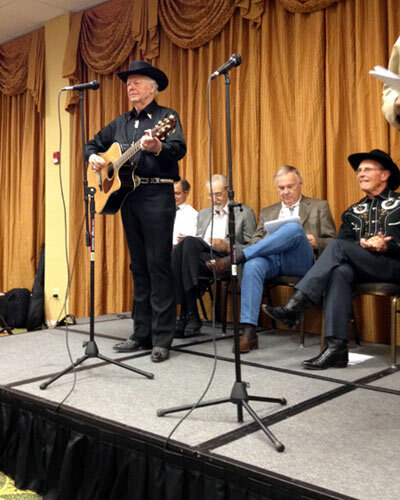 Gary Clarke was hilarious as Hey Boy at the “Have Gun Will Travel” radio recreation. 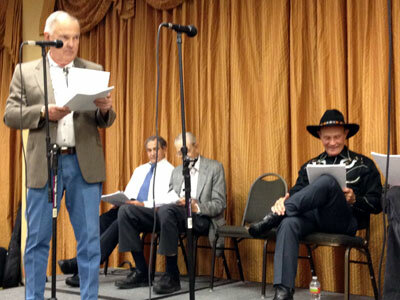 Seated are Boyd Magers, Don Quine and Don Pedro Colley. 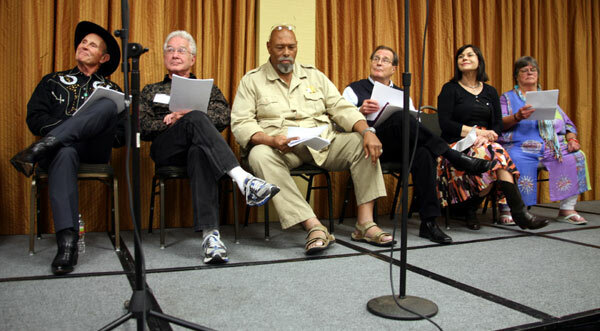 Helping to recreate radio version of “Have Gun Will Travel” are (l-r) Don Quine, Gary Clarke, Don Pedro Colley, Charles Briles, Diane Roter and Sara Lane. 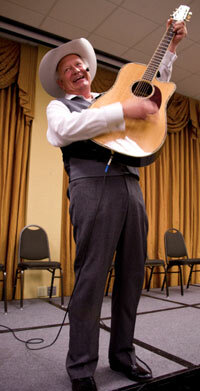 Johnny Western wound up the radio recreation with the TV theme song he wrote and sang for “Have Gun Will Travel”. Seated are Bobby Crawford, Jim Kocher, Boyd Magers and Don Quine. 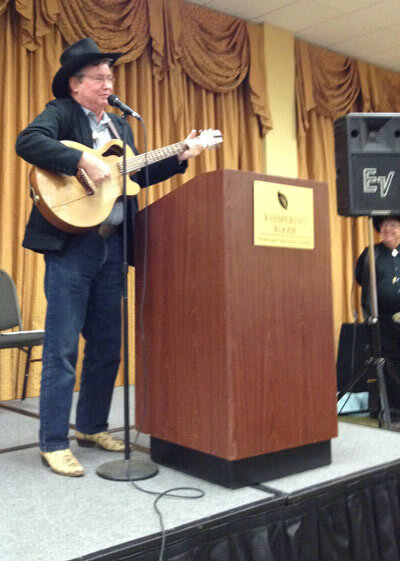 Rex Allen Jr. did a fabulous show for everyone at the banquet, singing all his hits and a few of his father’s. 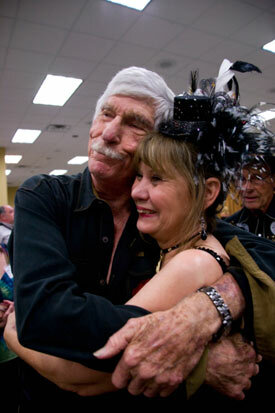 Rex gives a big hug to Carol Ann Kellum during his performance. 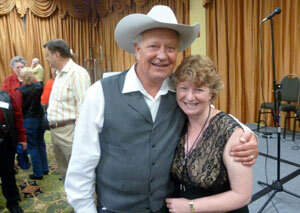 Boyd Magers smiles as he clings to Karla Caudill of Whispering Woods and festival co-ordinator Bonnie Boyd. 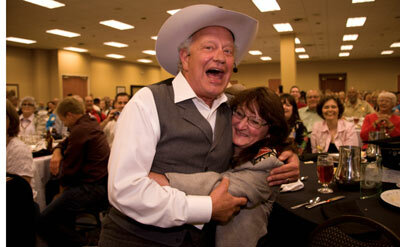 Fliss Bonello gets a hug from Johnny Crawford. 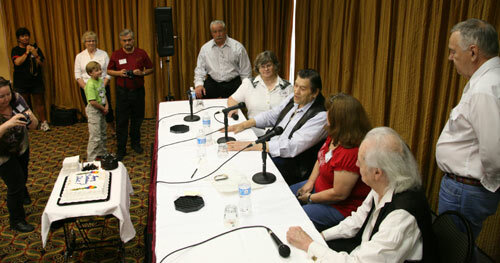 ...as well as Rex Allen Jr.
L. Q. Jones and Bonnie Boyd smile for the camera. More photos on page 1, 3.